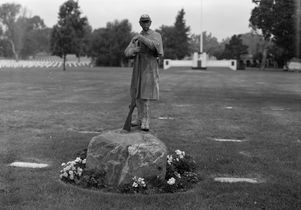 About 11,000 Union veterans are buried at the Los Angeles National Cemetery, site of this Civil War soldier monument. Is the South the only place where the Civil War lingers? Cities nationwide — including in California — are confronting their Confederate history after a violent and fatal weekend in Charlottesville, Virginia. The flashpoint was, in part, a statue of Confederate General Robert E. Lee. UCLA history professor Joan Waugh is one of the country’s preeminent scholars on the Civil War. 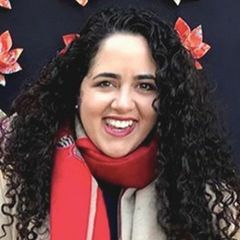 She teaches several related classes, including The Memory of the Civil War in American Culture, and in 2015 she co-wrote “The American War: A History of the Civil War Era.” Here, she provides her expertise and insight to explain how California, a state with no Civil War battles, ended up with Confederate graves; the many ways the war touched California; and some of the influences that California had on the war. 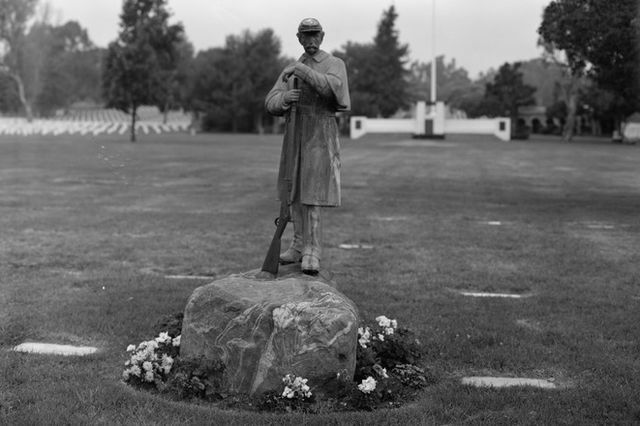 With the recent Civil War memorial controversy at the Hollywood Forever Cemetery, many people were surprised to learn that there was any Civil War history in Los Angeles, let alone Confederate veterans buried here. Are there other memorials or monuments to the Confederacy in Southern California? I’m not aware of any statues, but there are a surprising number of places you can go to find Civil War history. The Huntington Library in San Marino has one of the country’s most significant Civil War archives. Perhaps their most famous is the Abraham Lincoln collection, but it’s certainly rich in Confederate materials as well. Other places include the Lincoln Memorial Shrine in Redlands, or the Drum Barracks Civil War Museum in Wilmington [a neighborhood of Los Angeles]. While 11,000 Union veterans are buried at the Los Angeles National Cemetery, ex-Confederates’ graves are scattered throughout the state. After the war, many thousands of Civil War veterans came west, including a smaller but still sizable number who fought for the Confederacy. They built railroads, worked in the mines, took advantage of the oil boom, toiled in agriculture and sought business opportunities. Since the United States fought the Civil War to restore the Union, the defeated Confederates’ citizenship rights were fully restored fairly quickly. With those rights came the ability to memorialize their cause in a variety of ways, including statues and monuments. Therefore, although they were a smaller population compared to ex-Union soldiers, ex-Confederates in the 1870s, 1880s and 1890s added to the swelling population of the Golden State and the Los Angeles area. They tend to be buried in Southern California cemeteries. I haven’t tracked down what Confederate memorabilia is on display, but like the graves in the Hollywood Forever Cemetery, I’m sure traces are here. You mentioned that many Civil War veterans came to California. The Los Angeles Times op-ed that spurred the removal of the memorial from Hollywood Forever notes that more than 250 Southern Californians enlisted in the Confederate army. How did the state as a whole compare? Well, 17,000 Californians enlisted in the Union, and many of those deployed in the Southwest. A much smaller number — little more than 250 statewide — joined the Confederacy. Republican California remained firmly in the Union column throughout the war effort, with their gold and material resources flowing into the United States Treasury. So did Californians already remove most local Confederate monuments? Or were there not many here to begin with? The dominant memorialization in Los Angeles and throughout California is Union, not Confederate. But there were a few instances. In the decades after the war through to the early 20th century, Confederate organizations were established to support the small number of veterans who needed help. For example, in the 1920s an old soldiers’ home, “Dixie Manor,” was opened in San Gabriel to receive disabled veterans. The California Division of the United Daughters of the Confederacy supported the effort. Today, the main place you’ll see Confederates portrayed are in Civil War re-enactments. There are a lot of such reenactments in California, staging battles with specific names and that represent both sides. Although not usually put on a list of California contributions to Confederate mythologizing, I believe that two classic Hollywood films — D.W. Griffith’s “Birth of a Nation” in 1915 and David O. Selznick’s “Gone With the Wind” in 1939 — did more to promote a favorable view of the Confederate nation than all the monuments put together. What were some of the other ways that the Civil War touched California? California played a vital part in the tumultuous decade of the 1850s. Certainly as the Civil War was declared, both sides eyed California as a great prize for its gold, its ports, and its position in the Pacific, and that continued during the war. There was not a battle fought in California, but there were a number of camps and forts used by the Union. The only Civil War fort open to tourists that I know of is the Drum Barracks in the Wilmington neighborhood of Los Angeles, where a number of prominent generals were stationed even before the war. Some were from California, like Albert Sidney Johnston, who left to become a top general for the Confederacy. How did Californians view secession? There was a vocal secessionist movement in California as part of the Democratic Party. One of the state’s first two senators was a Mississippi plantation owner and Kentucky-born doctor, William Gwin, who came to California in the 1840s. Gwin led what has been called the Chivalry faction of the Democratic Party. The “Chivs” were strong supporters of slavery, and like the national Democratic Party, wished to preserve the Union while keeping slavery. When war was declared in 1861, there were some Chivs who volunteered for the Confederacy or left for the South, but most Democrats remained loyal despite opposing most Republican war policies. When the South seceded, Gwin left California to return to his plantation in Mississippi and join the Confederate cause. Afterward, he once again lived in California and is buried in Mountain View Cemetery in Oakland, California. California attracted many Southerners during the Gold Rush and beyond, and they were strong supporters of slavery, and later the Confederacy. Some Southerners did bring slaves with them, though that wasn’t the first slavery in California. Under Spanish rule, California allowed slavery, mainly of the indigenous people. Under Mexican rule slavery was abolished in 1821, although various types of unfree labor continued, especially with Native Americans. Under U.S. rule, white settlers from Southern states brought their slaves, a few thousand or so. The 1849 California constitution banned slavery, although unfree labor persisted, with little interference from the state. But I think it is important to acknowledge that our state’s history and involvement in the war was determined by the decision to stay in the Union. Abraham Lincoln secured the vote in California in 1860 and 1864, and our two Republican governors at this time marshalled support for the U.S. Those governors were part of why 17,000 California men enlisted in the Union army. Californians should be proud of our state’s stalwart support of the Union war effort. It’s still surprising and uncomfortable to think of Confederate secessionists and Southern plantation slave-holders in California. History hurts. There’s much to be ashamed about in our past, but we have to understand it nonetheless — the good, the bad and the ugly — to get a full depiction of where we are today. The American political nation has always been divided. Democrats and Republicans have always seen each other as the enemy, and in the 1850s it intensified to the disintegration of the United States. I don’t think that’s going to happen today, but I do believe we are more divided than we’ve ever been since the Civil War. Here’s some food for thought: Is California following in the footsteps of Southern secessionists by proposing our own secession from the Union? My bottom line regarding the overall controversy consuming our country is that removing or destroying monuments without debate or discussion is dangerous. I believe that localities have the right to move what statues they deem as offensive, and not every Confederate monument should be preserved, but a word of caution is needed. I do not advocate sanitizing the past but interpreting it, using history and commemoration as an educational tool. This has already been done successfully at many historical sites and landmarks. There are two sides that can engage in an honest and rational disagreement about the issue, but sadly, right now and for the foreseeable future that seems unlikely.